FREE CEREAL & HOT DRINKS EVERY MORNING! 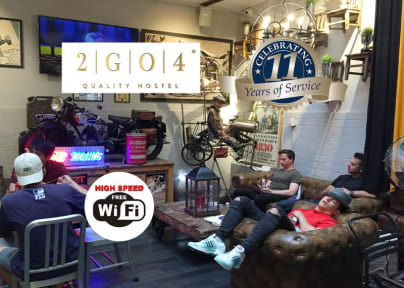 We offer our guests every morning (between 07:30am and till 10:00 am) FREE HOT DRINKS with compliments of 2GO4 Quality Hostel! Our hostel is ideal for budget travellers, friends and individuals. We offer quality at affordable prices, with maximum comfort, style and an ‘urban home-away-from-home’. This place is unusual and strikingly different by way of its pleasant design, friendly atmosphere and relaxing ambience. We’re located right in the heart of downtown Brussels! All major points of interest are within walking distance. Fashion, food, art, architecture and nightlife - just step out and enjoy all the sweet pleasures of your visit to Brussels. Some rooms have a bathroom in the dorm room, while others have a bathroom shared with other rooms. Some rooms are smaller, some are bigger. Allocation is based upon our availability. We have free city maps of Brussels, including insightful information on the area’s best pubs, nightclubs, major tourist attractions and where to get the cheapest and tastiest food, chocolate, waffles and beer. There’s also free Internet and Wi-Fi available. Please note that there is a maximum age limit of 35 years in our dorm rooms. There’s no maximum age limit in the private rooms. Minimum age in any of the rooms is 18. We accept groups of maximum 10 people. Please note: Belgian government has introduced a city tourist tax of €4.24 per night per person for your stay, which must be paid on arrival. Our hostel is not responsible for postal parcels sent in to our hostel. Great hostel, close to city center, a bit noisy outside at night, breakfast = cereal, overall great stay! Clean rooms with free breakfast. You can buy good Belgian beer at reception. Situated between Gare du Nord and city center which makes travel easy. Nice, central location which makes it easy to access all parts of the city. Rooms were very nice. I wish the bathrooms had paper towels to wash hands. As well, the comforter had a stain. They also didn't give me a comforter slip- only two fitted sheets. Other than those few minor things, a nice place to stay with good value for your money. Stayed in a 10 person mixed dorm. It was spacious and each bed had a light and outlet. Storage was decent size. The staff were very friendly and helpful and made check in and check out smooth. Breakfast was coffee/tea/hot chocolate and cereal. Overall pretty good place to stay. The staff was extremely helpful. The lounge is cool. A little annoying to have to bring the bedding up when you check in but all in all a solid hostel. The reception was really kind to me. She explained every single detail about the check in/out and the facilities. However the shower booth was tiny and the water came so little by little so it took me time to wash out the bubbles from shampoo. Except for the booth, everything was fine. I stayed in a 6-bedded room in that hostel and my bed was at the top of the double bed. The problem was there is no socket/electrical plug near the bed where I could charge my phone. So I had to go down to plug it. 😩 Location wise, it is accessible to the city centre, but I found it hard to sleep since the hostel is located on a main road and the sound of vehicles or shouting people could be heard clearly from our room! 😑 Breakfast is too basic,they only have oats and cornflakes. the locker cannot be locked . This hostel was okay for one night, but I didn't personally think it was worth the amount of money we paid for it. The downstairs/lounge is very nice, but we waited huge periods of time to get helped at reception and slept 6 to an incredibly small room.